Artificial intelligence is the next frontier, and whether you’re worried about your job or excited about the opportunities, there are questions that need to be answered. 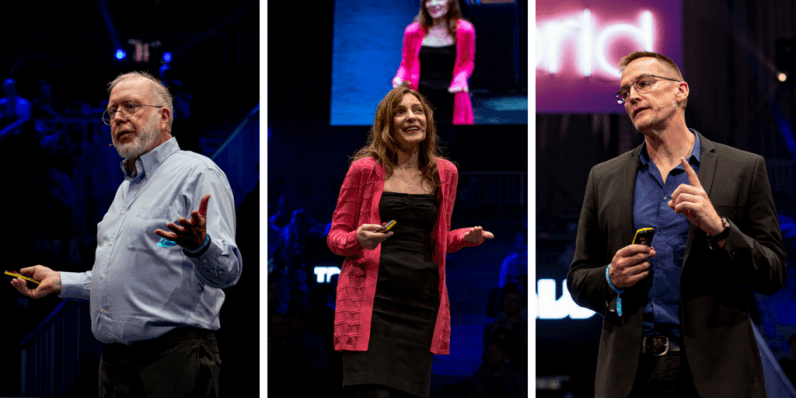 At the Machine:Learners track at TNW Conference last month, leading experts did just that, by sharing their thoughts on the future of AI. In case you missed it (or if you want to relive it), we’ve recapped the highlights. It’s also referred to as the AR cloud, V-cloud, or the VR cloud, but Kevin decided to come up with his own (much cooler) buzzword. “Just because I can, alright?” he joked. There have been two eras that we’ve encountered in terms of the internet. The first, said Kelly, is the ‘network of documents.’ Information was made machine-readable — this is essentially the birth of the web. The second era was the ‘network of people’, which was basically the birth of social media. “It made human behavior machine-readable. You can use algorithms to categorize our habits, for better and for worse,” he explained. The people who have controlled these steps — Facebook, Google, and WeChat — have become very influential. Now we’re at the dawn of a third era, and the people who own it will be extremely powerful. “We’ll be able to hyperlink buildings, objects, places… This will make the entire world machine-readable. This is a big thing,” Kevin explained to the audience. The logistics are made possible through virtual reality, augmented reality, and mixed realities technology. “The world will be scanned and accessible through iPads, wearable glasses, or your mobile phone,” he explained. There are going to be a thousand scary problems emerging from this. Issues of privacy, control, bias and algorithms, and many more that we haven’t thought of. But there will also be a million new opportunities. He likened AI to nature — how it should be able to problem-solve, adapt, and change, rather than simply imitate humans. Andrew showed the audience a video of crows and their amazing ability to do this. On highways, crows drop nuts from an exact distance, to crack but not shatter the edible insides. What’s remarkable about them is that they’ve adapted to road safety — they only drop the nut when the traffic light is red, so the crows and their food don’t get crushed from a vehicle. According to Andrew, this kind of adaptation is exactly how AI can improve our lives. Andrew discussed how this is being accomplished through implementing AI in our devices. Rather than connecting to the cloud, having AI embedded in our smartphones achieves real-time advantages that we can all enjoy. “We are just starting to see the potential it’s unlocking — it’s the future,” he stated. Andrew showed how the Huawei Mate 10 smartphone, which is the first with advanced AI, was famously programmed to drive a car. It was a shameless marketing stunt. We wouldn’t let it loose on the road outside of a controlled environment, but actually it shows the power of what’s possible. He went on to describe future possibilities, namely AI’s ability to let us learn at previously unprecedented rates. He shared a study he conducted, in which it revealed that we make an average of 35,000 decisions a day. Surprisingly, 99 percent of them are unconsciously made. With AI in our smartphones, it could help us make those menial decisions in our pocket; freeing up time to learn and become experts in our fields. Take photography as an example. Already, our phones have made it easier to take expert photographs. It won’t make us seasoned professionals, but we can at least achieve similar results. Pamela began by saying how we already have emotional connections to our technology, like the little icon that indicates that someone’s typing. It can evoke strong emotions from us, ranging from anxiety to excitement. When we look at AI, she commented on how it doesn’t take much for us to humanize it. If it has eyes, or a voice, or movement, we’re already thinking of it as a human. According to Pamela, by 2025 we’ll reach “the age of machine readable emotion.” While AI is already starting to read our face, voice, and gestures, it will one day be able to use our gait (the way we walk) and biometrics (our heart rate) to determine how we’re feeling. The implications are far reaching, as it can be used to identify issues like PTSD, or distracted drivers in their car, or even to further understand the needs of babies. The example that really seemed to resonate with the audience was an app that monitors your heart rate as you interact with friends, and identifies who makes you calm, aroused, angry, or stressed. Pamela tried it out and discovered that her husband Steve made her the most and the least angry. “If you’re married, you’ll probably understand,” she joked. The implications of emotions are vast, because they help us prioritize, they help us reflect, they help us deal with the complexity of life. And so maybe what we’ll see in this next era is a coming together of human and machine. Maybe we’ll achieve a coupling that brings us better emotional intelligence as humans, through the help of AI. You’re right to be sceptical — there’s a lot of things that can go wrong. We could go all ‘surveillance system, social scoring’. But AI emotional intelligence is going to expand beyond ours, and what I want to see for the future is that hopefully our emotional intelligence will match it. Our partner Huawei helped make Machine:Learners one of the most exciting tracks at TNW2018. We featured a heap of experts to talk about the future of AI, so if you want to see their talks, you can!